A prisoner who escaped from a security van in Edinburgh has been found. Conlon Carr, 19, was being taken to St Leonards Police Station from HMP Polmont YOI at 11:35 when he broke free from the G4S van. 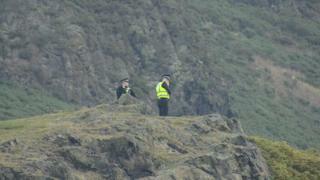 Police carried out searches in the St Leonards and Arthur's Seat areas of the city in an attempt to trace him. A spokesman for Police Scotland said he had been traced at about 14:25 in the Craigmillar Castle area. A report will be sent to the procurator fiscal. Willie Galloway, operations director G4S said: "A person in our care managed to escape from custody officers while being escorted back on to a prison vehicle and has now been re-apprehended. "We are investigating the circumstances surrounding the incident and will take appropriate action as required."